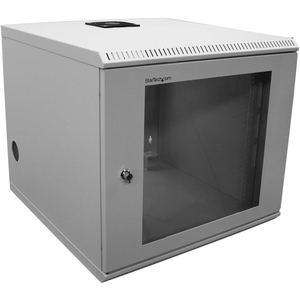 Fit a maximum amount of rackmount equipment in a minimum amount of space with the StarTech.com CAB1019WALL, a 10U wall-mounted steel server cabinet. The CAB1019WALL mounts to most wall materials, allowing you to securely position your rackmount equipment exactly where you need it. 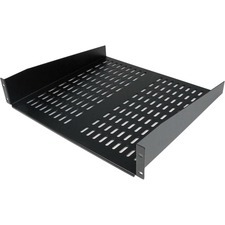 A 5-inch roof-mounted fan continually blows 85 CFM of cooling airflow over your networking equipment. The vented side panels work with the fan to keep the air moving through your case, helping to keep temperatures down and dust out. The cabinet's lockable, smoked acrylic front door is removable and can be switched to open to the left or the right to suit your environment. The CA1019WALL is constructed of durable steel and comes fully assembled.